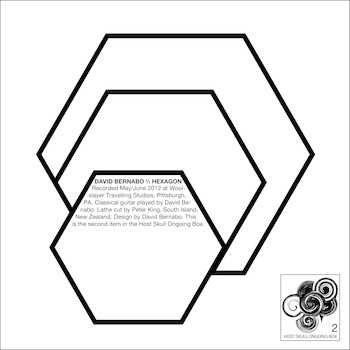 Last fall, Pittsburgh-based artist David Bernabo released a curious little item called Hexagon. It’s a short musical program on clear, lathe-cut vinyl… not so uncommon these days, but the record itself is hexagonal in shape and packaged in a machine-stitched vellum sleeve. Business as usual for David, as any who’ve followed his still young artistic career can attest. David draws from a seemingly endless pool of energy and ideas, routinely recasting his role: in visual arts as photographer, painter, videographer, and sculptor; in music as avant-rock band leader, symphonic composer, producer, ceremonial pianist and, on Hexagon, classical guitarist. In 2011, he founded the “Host Skull” brand for his new projects in collaboration with fellow musician, Will Dyar. Hexagon, which features David only, is the second item in their Host Skull Ongoing Box. The record begins with its longest piece, “Fee for the Theory of Ideas.” In the opening passages, meandering single-note figures are interspersed with sliding intervals, bluesy bends, random harmonics, and fleet, spazzy hammers and pulls that I’ve come to associate with David’s guitar playing. Roughly two minutes in, the tide turns… the piece regulates around a passage that has a “raga” sort of feel. In one instance during this section, it sounds as though David fails to cleanly hit a harmonic note, but rather than simply move on, he embellishes the “miss” with series of similar “plinked” notes muted near the harmonics. Assuming I heard it accurately, it’s a humorous and appreciated nod… the mark of an experienced improviser. In this first piece, as in the others I’ll discuss, it’s often difficult to differentiate what is improvisation versus what was premeditated, obviously to David’s credit. “Noumenon and Blues” is next up. In Kantian philosophy, “noumenon” is thought of as “thing-in-itself,” impenetrable to the senses, with the opposite being “phenomenon,” or thing as at appears to an observer. I’m not sure what the heck the song title means, but will speculate that David is commenting on the word “blues.” Fans of solo guitar and other music have undoubtedly encountered the word “blues” tacked onto the end of a piece which is not really a blues, but rather its own thing (in itself). “N & B” does have a bluesy vibe, rendered with elegance akin to John Renbourn’s blues interpretations. “Audience Seats” opens side two. Sounding initially like a romantic piece, it turns uneasy before giving way to frenzied improvisation; the opening theme is reestablished, adorned with improvised figures, giving it a dual sort of personality. “America’s ‘We Are Watching’” is a quick sketch in which David lets his fingers land in seemingly random, mechanized fashion on their way to an energized ending. The final cut, “Hvidovre” is built around a lovely, exotic sounding melody that develops and varies over the course of the piece. David’s playing here is at its most raw and emotional. An interesting analogue to Hexagon is Leo Brouwer’s set of twenty Estudios Sencillos. Brouwer’s work is admittedly more formal than David’s, but has similar unpredictability that is refreshing in the context of classical guitar music. Assuming David presents another collection of guitar solos at some point, it may benefit him to develop some of the melodies in a more deliberate fashion, even if it requires descending briefly from the musical heights he capably navigates. In other words, hearing Hexagon unfold in real time is highly rewarding, yet it’s uniformly complex and idiosyncratic to a degree that little resonates when the needle is lifted, and I wouldn’t mind to having bits and pieces of it stuck in my head for a while. I’d be remiss to not touch briefly on the project’s physical presentation. My turntable is of modest quality at best, but the record plays very quiet and the sounds subdued compared to the digital audio.¹ The “mellowing” effect on the guitar is sort of nice, but some detail in the recording is lost. This could very well be an accepted fact of life for the lathe-cut vinyl scene that seems to be trending in underground music. Either way, this is a great little project that is well worth hearing.